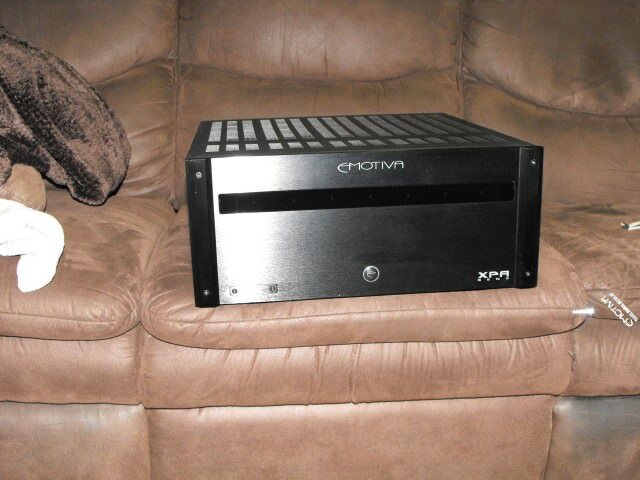 Forums » General Discussion » Home Theater » blown speaker and faulty sub amp. #424151 - 03/16/17 03:05 PM blown speaker and faulty sub amp. One of the woofers on my QS8's blew yesterday while I was watching Enders Game. Cool flick btw. I decided to buy a replacement woofer from Axiom, its on the way. Debbie mentioned to me that there is a good chance this happened because I may have the channel level settings too high. If anyone has any comments on insight on this I would appreciate it. I thought the channel levels just worked as a volume setting for each speaker. If I turn all the channel levels down, as to keep the levels per speaker where they sound good, I will just have to turn the volume up on the system to keep the sound in the room at my normal listening levels right? Doesnt that defeat the purpose of turning the channel level down or does the channel level have somehow a stronger signal than the whole system volume? I am also having a problem with my subwoofer amp. Recently it started going into standby mode in the middle of a movie. Now it does it often and I find myself turning it off manually and back on to get power to the sub. Its almost like its not getting a signal from my receiver so its shutting itelf off. I am using a Yamaha RX 3050 9.1 setup. and a Sunfire HSR IW8 in wall sub with separate amp. i have only had one bad driver and axiom sent a new one, turns out it was the tinsel lead on the back rubbing the driver. Did the driver quit working completely and did you try the driver out of the other speaker to confirm. Maybe the crossover went bad , caps do fail from time to time. As for the sub, does it feel like its getting too hot and does letting it sit for a while allow it to resume working. You need to level match your system with a reference track of pink noise or whatever your AVR has (usually 1khz centered pink noise). Download an app with an spl meter at the very least. It wont be accurate, but all channels will be treated the same at least. Dont use auto setup, dont set by ear. Turn the gain on your sub amp down and the sub preout level up on your yamaha. Again, set the level first with a reference tone and adjust to taste from there. You want to be around -3 to 0 on your sub trim setting. All your channel levels are supposed to be a reference to a test level benchmark. It is not a volume setting per se. Learning the relationship between channel trim level and system volume is important. If you need to max your trim levels to hit a reference of 75db your system might have problems if you crank the volume. Choose a lower reference tone, like 70db, to get your trim levels away from max. The driver all of the sudden started wth that "buzzing crackling" sound that is consistent with a blown speaker. The amplifier does get warm but it has at least 8" above before the top shelf and the front and rear of the cabinet are open air so there is plenty of ventilation. Also I did try the sub directly plugged into the DVD. Same effect. After about 40 min went into standby mode. Although the sub display still showed a signal coming through it was pushing no sound to the woofers. Well nothing is perfect, how old are your QS8's. You can get an app for your smart phone and they are pretty accurate. I have a Iphone 4s and compared it to my calibrated sound meter and its as close as god is to damn , so plenty accurate enough to get all your speakers properly balanced. Let your room correction set the distances and then use your phone from your listening position to get them all set to the same db. I am not sure if the yamaha has a manual mode that outputs a sine wave but i think it would. If your fronts are louder than the rears lower the fronts rather than jacking the rears so you dont overdrive the preamp level and possible introduce distortion. Receivers have a preamp that drives the amp and if you get the levels set too high you may possible cause the preamp portion to clip. Try putting a fan on your sub amp to see if its heat related. Subs take a lot of power when they are driven hard. IMHO if it takes 40 mins it is most likely heat related and or your subout on the the yamaha is set to high. Poor Aarons. Just got a space finished and a PJ and Amp and Speaker are giving issues. You'll get it figured out. I am confused by your use of the word DVD. Do you not have a bluray player? DVD would explain why you are using dolby logic codecs for 9.1 I guess. You could still use Dolby Surround to scale legacy sources into immersive audio(ish). I do seem to be having a lot of issues that's true! No pity party here though.... typically these wounds are self inflicted. My QS8's were bought in 2009 but sat in storage until now.....untimely divorce! Ouch. So although they are older models they are still in a sense new. Yes sorry it's a blue ray not a DVD. Also I handnt considered the sub amp issue might be a heat problem. I assumed the Cabinet was adequately ventilated with open air in front, behind and above. I didn't occur to me that heat would be an issue. I'll try a fan before I start blaming the equipment. Any recommendations on which one? Would a fan really make that much a difference? Any recommendations on which one? Would a fan really make that much a difference? Ideally a tube fan, with silver power wires and separate pre and power stages. Should I buy a fan to try it or just place a floor fan on the unit and run a test to see if that fixes the problem? I assume a standard room fan will have a similar effect at least good to test it out?